I find it so much less stressful if I actually have a plan and know that I have the ingredients in the house. 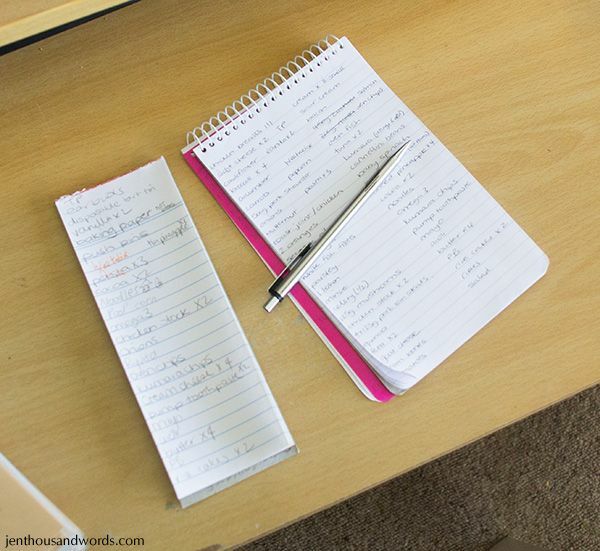 It takes a little time and effort but I'd much rather spend the time and energy on doing the planning than stress every evening when I have to conjure up a meal. 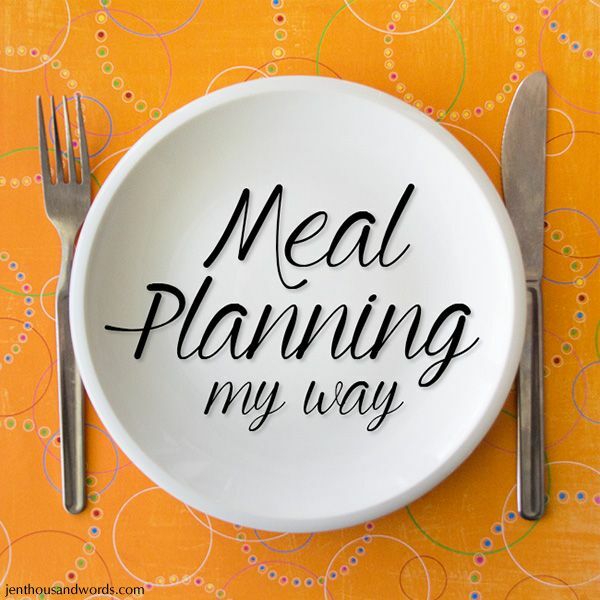 I thought I'd share my meal planning process. I start thinking of my meal plan a few days before I go grocery shopping. I usually shop on every second Wednesday (which is payday) so I start planning the meals on Sunday or Monday. I plan about ten meals, which should cover two weeks - the four extra nights will be covered by leftovers or impromptu meal ideas, for example if there is leftover pork from a roast dinner then the next night I might make pork fried rice with it. 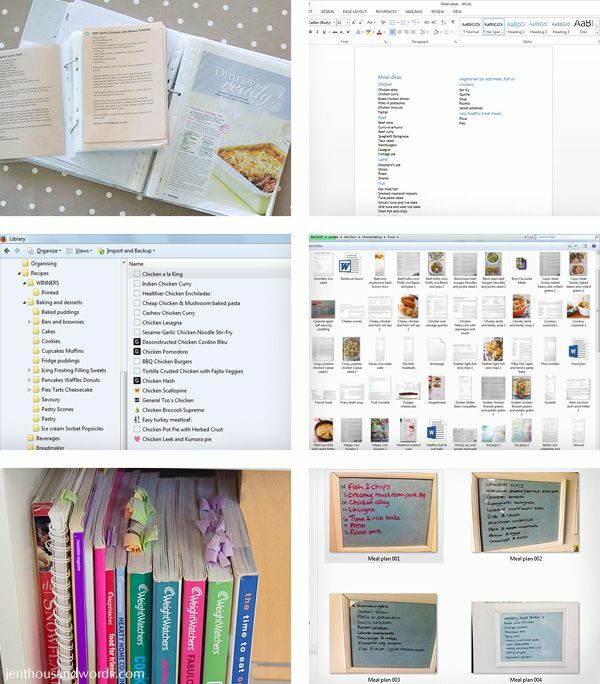 I generally try at least one new recipe a week, and if we all enjoy it then I type it out and put it into my small recipe file. 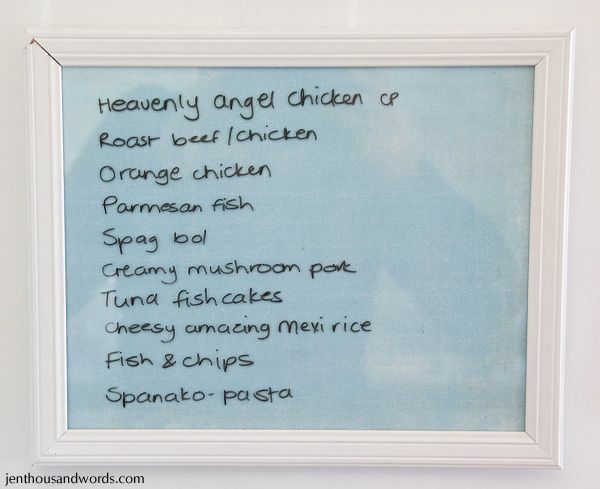 I write the meal ideas on the frame on my fridge (click here for more info). 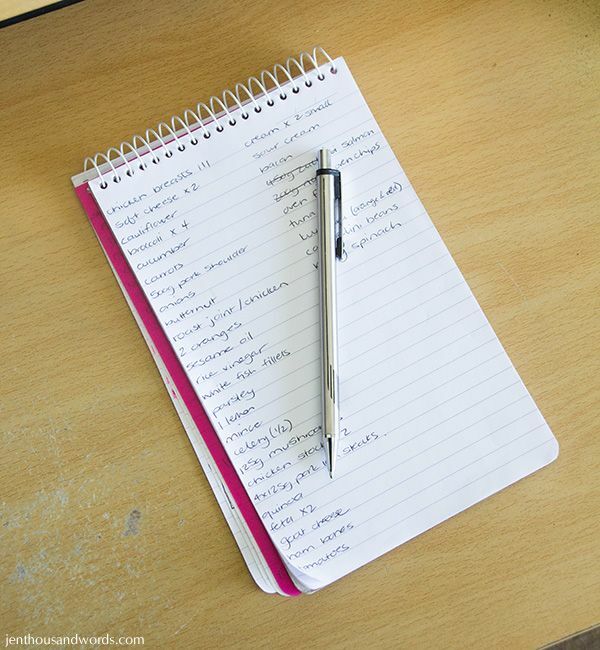 As I plan the meals I write a shopping list in my notepad. 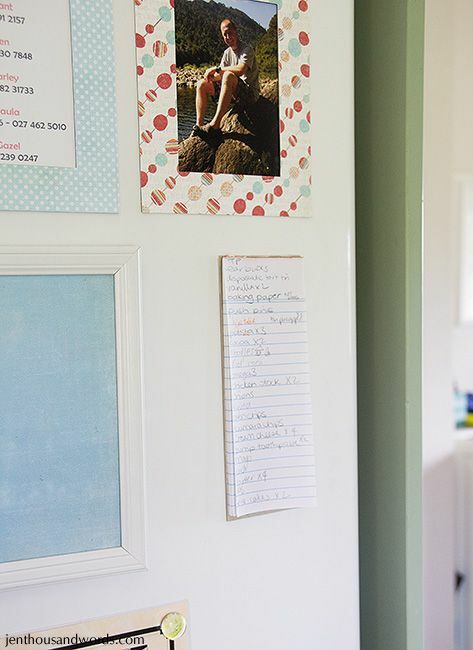 We also have a running list on the fridge, on which we jot items as we run out. Once I've made the shopping list for my meal plan I'll transfer over the items on the fridge list. I also check the larder, fridge, freezer and pantry and see what staples we're running low on that I need to replenish, for example how many loaves of bread or bottles of milk I need to buy for the two weeks (I buy once and freeze them rather than having to keep buying through the fortnight). 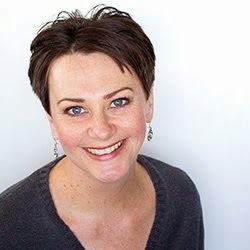 I will also copy and paste any online recipes that I want to cook into an email and email it to myself. That way I don't have to print them or run back and forth from the kitchen to my computer; I can just work off the email in my phone. Then comes the horrid part: doing the grocery shopping. In the UK I loved shopping online and getting our groceries delivered, but over here there is only one supermarket that does it and it's too expensive for us, so off I go to Pak-n-Save. 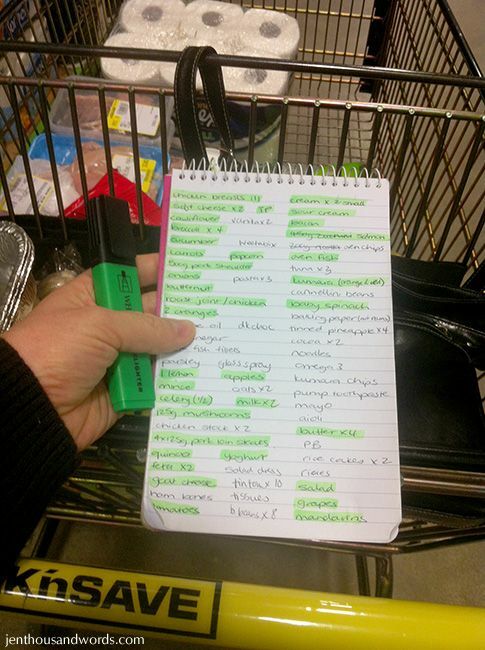 I use a highlighter to mark off the items as I add them to my trolley, so I can see at a glance if I've missed anything. I might change my meal plans if an ingredient I need is particularly expensive at that time, or if something else is on special offer. I usually do a separate shop at Bin Inn for bulk dried goods. I keep a separate list for items from Bin Inn on my phone. As I go through the two weeks I'll decide each day what I want to cook that night. Then I'll put a red dot next to that meal with a dry-erase marker, so the rest of my family know what we are having for dinner that evening. 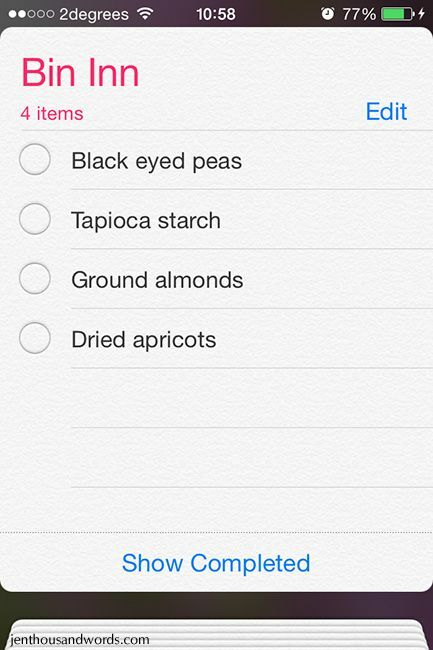 Once I've cooked it I erase it from the list. I start with meals that use ingredients that won't last long in the fridge. Food that requires ingredients that are pantry staples (like tuna or pasta) can be cooked towards the end of the two weeks. I'll also take into account things like particularly busy days that will leave me exhausted by dinner time (I choose a crockpot recipe or particularly easy meal for that night); whether or not Grant is home or on a late shift; whether or not we'll be having a big lunch; how much is in the fridge in the way of leftovers; etc. I stick loosely to the meal plan. Sometimes I switch things up using the main ingredient; for example recently I had sausages and mash on the list but ended up making sausages with microwaved potatoes and cheese and baked beans, as that was easy and quick and what the kids preferred (Grant was at work). As far as fresh ingredients like ham, fruit and veg goes, if there is money left in the budget I will pick up fresh replacements before the next big shopping trip. If there is no money left in the budget then we'll just do without (e.g. ham) or rely on tinned, dried or frozen (e.g. fruit and veg) until payday. As usual with these kinds of posts it sounds more complicated than it actually is. It really doesn't take that long to make a meal plan. When I really can't be bothered I just copy a previous meal plan, which takes all of the guesswork out of it. 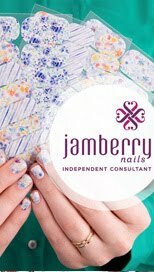 Overall I am much happier when I have a plan! Let me know if you'd like me to share my meal plans with you every fortnight; I'd be happy to do that.